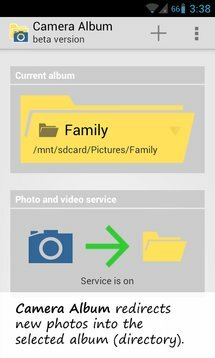 No more thousands of photos in one gallery. 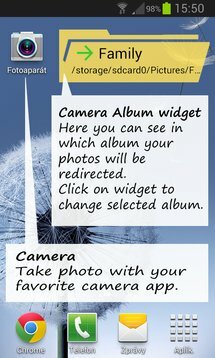 Do you have pile of pictures taken by your mobile? Do you have family photos mixed together with work photos? Do you want to keep an order in the gallery? 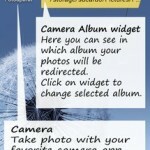 With Camera Album it is very easy. 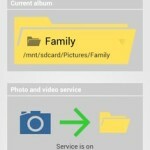 Application Camera Album automatically transfers the captured photos and videos (taken with your favorite camera- app) to the selected album (directory). You can create multiple albums (eg. Family, Work, Trip to Paris, Mountain 2014 …) and quickly switch between them before taking photo. The application also includes a widget to your desktop. This widget displays the selected album , if the service is running and on clicking it you can quickly switch album. We recommend to place it near the camera icon. Transfer of newly captured photo will not start right away, but after a short time (eg 1 min – can be determined in the settings). This time can be used for previewing and deleting photos. If you set the transfer immediately, there may be problems in some camera applications. In the setting is also possible to determine whether redirect only photos or videos also. You can also specify whether to delete the original photo and many others. The application supports English and Czech language. Other languages ​​can be added. -We add second small widget in size 1×1.